Great kit that includes all essentials you will need to get the kids back to school. Kit includes everything in the photo but colors may vary. This is a great bundle for basic essentials and more. Name brands: Crayola, Dixon, Fiskars, and Elmers. 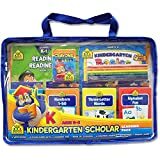 Great bundle that includes several essentials supplies kids will be required to have for back to school or anytime during the school year. Bundle includes everything in the photo but colors may vary. In this bundle you will get: 20 #2 pencils, 2 washable glue sticks, 10 washable markers, 10 colored pencils, 2 pencil/crayon sharpeners (piranha or owl shaped) color may vary, 1 pack of antibacterial hand wipes, 1 2-ply Puffs tissues box, 24 crayons, 4 dry erase markers, 2 large pink erasers, 1 70-sheet spiral wide ruled notebook, 1 college ruled composition notebook, 4 2-pocket paper folders with center prongs (red, yellow, green and blue), 1 pair of kids scissors (color may vary). Essential bundle includes materials teachers require most often saving you time and money. 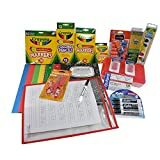 Great Back to School kit with all the Brands and Quality that parents and teachers know, love and trust. Reusable Dry-Erase Pocket Folder Write and Wipe design allows you to reuse the pocket over and over again with the dry erase pens.Colors may vary.